Princess Charlene and family in August 2015. I look forward to seeing what Princess Charlene of Monaco wears to the annual Pique Nique Monegasque that takes place every year in the principality just because I like the summery ensembles she wears to spend the day with her family at this event. In 2015 when her twins Gabriella and Jacques were babies she wore a beautiful blouse with floral appliqués. I love that she and Albert dressed the children in the traditional costumes of Monaco that day, those clothes are so adorable on children, and Gabriella looked especially cute in her striped skirt edged with black ribbon and the little apron with flowers embroidered on the front! Princess Charlene with Princess Gabriella, August 2015. Charlene at the Pique Nique Monegasque in 2016. I also loved Charlene’s look last year. At first I thought the flowers were embroidered on her dress but on closer inspection they seem to be part of the fabric. Still, I love the trompe l’oeil effect making them appear to be woven into the dress. Little Jacques was in on the act too, note the tiger appliqué on the front of his red polo. So cute! With Prince Jacques in 2016. I love appliqués and ribbon and flowered embroidery or trim any time of the year but it seems especially beautiful in summer and Charlene seems to favor it too. I hope she wears something equally lovely this year! 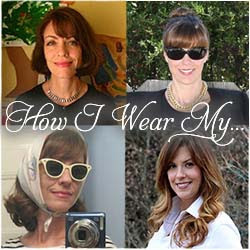 Let Charlene’s summer looks be your friendly reminder that July’s “How I Wear My” is devoted to Embellishment! If you would like to join us send photos to Adrienne and me at howiwearmy@yahoo.com by July 10, 2017 and be sure to include a description of your outfit, which we will use directly in our posts. I love her choices as well! The sandals look great too! That pop of color is fun! I have never seen her look better and love that dress and also assumed embroidery. Something tells me Charlene takes two bites of her entrée and hubby inhales the rest. Jill, did you notice how sleek and elegant those white trousers look when extended down to her champagne flute ankles? Her short hair makes her look very elegant.